While we might take the time to research and invest in a good mattress, our pillows are often overlooked--and that mistake could be hurting us. More than 50 million adults in the United States currently have a sleep disorder--and that probably doesn’t include all the people who just have a hard time sleeping at night. Failing to get a good night’s rest isn’t just a pain, it can have serious health consequences and impact your relationships and your career. It’s not just lack of sleep that’s impacting us--a whopping 80% of Americans are estimated to experience back pain. While these statistics are dire, fortunately, there are ways to ensure a great night’s sleep. One of those ways is by changing your pillow. 1. What’s My Biggest Sleep Concern? 2. Do I Have Any Allergies? Below, we’ve rounded up the seven best pillow selections that will help you get a great night’s sleep, overcome the sleep issues that are plaguing you, and feel amazing when you wake up. We’ve already made a case for how important a good pillow is, and we appreciate that the best pillows can sometimes be investments. That’s why we’ve taken the time to thoroughly research each product we’ve included in our list of best pillows below. We’ve combined customer reviews with available information to bring you a rating you can feel confident about. 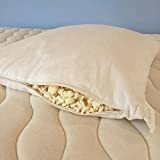 ​Latex is a popular option for pillow fill because it is supportive, soft, comfortable, and natural. This pillow from Sleeping Organic is made from organic latex, which means it’s completely free from any harmful chemicals--a massive plus for people who are eco-conscious and concerned about toxic materials. One of the most important features to note about this pillow is that it’s shredded latex. 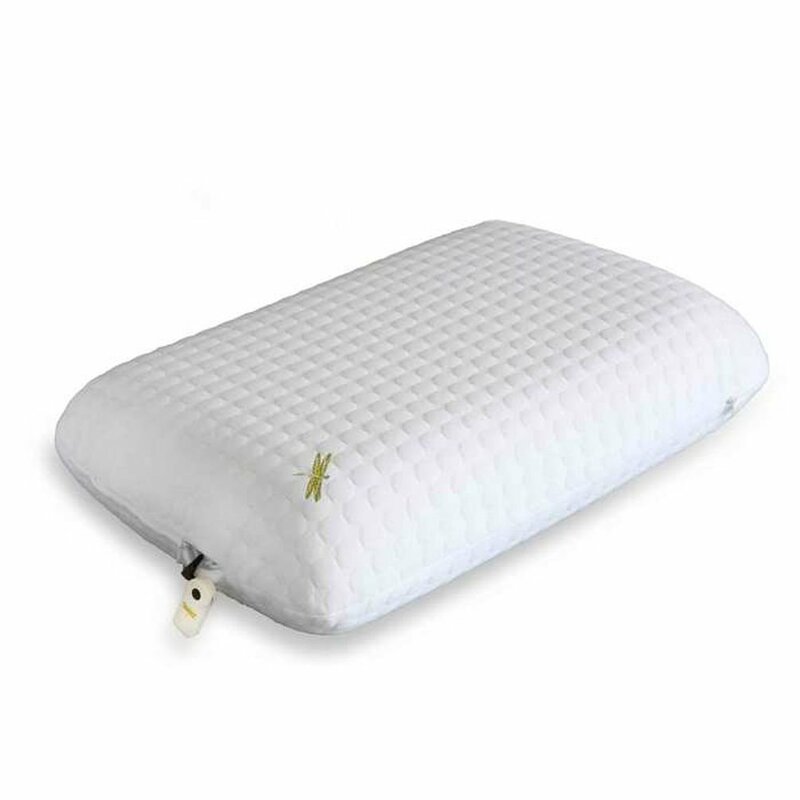 While most latex pillows today are latex foam, which can be stiff and make sleeping difficult for stomach and back sleepers, this pillow is made from shredded foam. This, combined with the fact the fill can be removed to adjust your loft preference, makes for a completely customizable latex pillow. In fact, king pillows come with as much as eight pounds of fill, a generous amount, to allow you to remove as much as you need to for a custom fit. It also comes with an organic cotton cover to extend the benefits of the latex. ​Feather pillows can cause huge problems for many people because they’re not hypoallergenic and they can be very expensive. Fortunately, down alternatives, like the one we’re featuring here, are a great option. 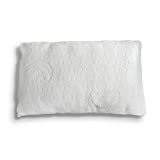 It’s perfect for somebody who suffers from allergies but still wants that plush, soft feel from a pillow. One of the reasons we love this particular pillow is that it has a customizable fill. Its double zipper means that you can remove fill if the pillow is too large. It’s filled with polyester fill, and the entire pillow is machine washable. Thanks to this customization, it’s an excellent choice whether you sleep on your side, back, or stomach. 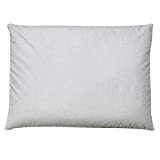 We also like this pillow’s affordability--it’s not the cheapest pillow on today’s list, but it is one of the cheapest, and about a third of the price of the Purple pillow or the Layla pillow. If you want a down alternative that’s affordable and customizable, it’s perfect for you. 85% of online reviews are four-star or higher, which is excellent in the pillow market! While you can find down pillows that are 100% down, we prefer a ratio of 80% down to 20% feather to provide a more supportive, responsive pillow fill. This 80:20 pillow from Egyptian Bedding Goose Down Pillow has all the plush you could want in a pillow, plus all the luxury of Egyptian cotton. The two biggest concerns with down pillows are whether they’ll lose their shape and whether the down will escape (it’s so fine that it’s hard to encase in a breathable material). The feathers in this pillow help to keep it from losing its shape (they also increase its durability) and because Egyptian cotton is made from ultra-fine threads, it’s able to allow air to move in and out without releasing down. Dreampad may well be the most innovative pillow we’ve featured today. Designed to be a clinical solution to lack of sleep, especially for children with anxiety, trauma, and autism, the Dreampad pillow is also a relaxation tool for adults. Here’s how it works: the Dreampad is a standard pillow with hypoallergenic eco-fill laced with embedded micro-transducers. These embedded agents connect with your phone or Bluetooth device to send music and sound waves straight to you--without anyone else being able to hear! Users report getting their best night’s sleep in years, and being able to calm anxiety and insomnia in the process and the company has been able to work with third-party researches to develop formal studies for publication in academic journals. These studies indicate that Dreampad is an effective tool for increasing sleep’s quality and quantity in people with PTSD, ADHD, Autism, and more. The pillow comes with a 30-day money back guarantee. ​​The Purple pillow looks like a weird purple blob, but it is, in fact, an extremely innovative approach to pillow design. Instead of filling the traditional rectangular shape with fill, Purple has invented a design that utilizes non-toxic, food-grade material (it’s purple, of course), which is soft to sleep on but firm enough to provide the support your body craves. Thanks to its grid-pattern, it allows air to flow freely, and while it sleeps something like memory foam, it isn’t hot and sweaty like foam. It’s also designed to have firmer edges and a softer middle so that your head can be cradled. The material is antimicrobial and designed to maintain its shape for years--there’s no fluffing needed in the middle of the night. ​Buckwheat pillows have been used traditionally in Japan for centuries. Made from buckwheat hulls, the pillows are loved for how they conform to your head, neck, and shoulders. Used more recently as orthopedic pillows (pillows that correct your body’s alignment or posture), buckwheat pillows are popular choices among people who suffer from back or neck pain. While there are many buckwheat pillows available on the market today, our pick for the best pillow is the Sobakawa Buckwheat Pillow. At less than $20, it’s extremely affordable and comes with a 100% cotton covering to allow air flow. Plus, if you frequently complain about a hot pillow, you’ll love the cooling properties of buckwheat. Buckwheat pillows are not for everyone and what we find is that people tend to either love them or hate them! The people who love them, however, report experiencing significantly less neck and back pain, which is a difficult benefit to ignore. Below are the top pros and cons for the Sobakawa Buckwheat Pillow. ​​The Layla pillow is made by Layla, a popular bed-in-a-box online mattress retailer who specializes in mattresses that have different firmness levels and copper-infused outer layer to keep things cool. Layla’s pillow is our pick for the best pillow for side sleepers thanks to its high loft, delightful combination of support and softness, and copper-infused cover. For their fill, Layla pillows use fiber from the seed pods of Kapok trees. Kapok trees are huge tropical trees found in Mexico, Central America, the Caribbean, and throughout South America and Africa. Kapok fiber is sustainably harvested and free from many of the toxic chemicals associated with other natural fills, such as cotton. It weighs much less than cotton, and when combined with Layla’s memory foam shred, you get a soft, fluffy pillow that maintains tremendous support--even for side sleepers. The other great thing about the Layla pillow is the copper that’s infused in the covering. Copper acts as both a natural microbial and a coolant, helping to counter the potential warming effect of the foam. Layla has also obtained a CertiPur-US certification for its memory foam, which means the foam is low VOC and free from heavy metals and toxic chemicals such as formaldehyde. Finally, Layla provides free shipping, a five-year warranty, and a 120-night trial. If, after 120-nights, you decide this pillow isn’t for you, you can return it for a full refund. 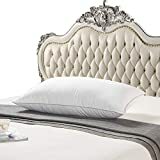 If you don’t wake up now with aches and pains and want to simply replace the fluffy pillows you enjoy now, down or alternative down pillows are good choices for you. If, however, you struggle with insomnia or anxiety that keeps you from sleeping, the Dreampad is probably the best choice for you. If, however, you’ve identified neck and back pain as your primary sleeping concern, you should try a buckwheat pillow or the Purple pillow due to their innovative approaches to solving sleep problems. If you’re allergic to down (or want to avoid it for other reasons) or latex, the Egyptian Cotton down pillow and the Sleeping Organic latex pillow are not good choices for you! Whichever pillow you choose, the seven we’ve included above are made from high-quality materials and have proven track records for improving sleep. We can’t wait to hear about how much better your nights get after you purchase your new pillow! « Helix Mattress Review: Is This Mattress The Right One For You?